Scientists have seen an assortment of albino animals including dogs, cats, mice, and rats, but an albino killer whale would be a new finding in the water world. 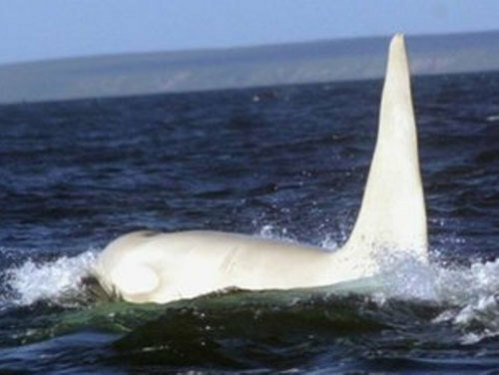 What could be an albino killer whale was spotted in the Pacific Ocean off the coast of Russia. Researchers were minding their own business, studying social and acoustic interactions of whales and dolphins when they unexpectedly spotted a six foot white dorsal fin jutting out of the Pacific. The white fin has dubbed him the name "Iceberg." The white dorsal fin was the inspiration for the name "Iceberg". The size of that white fin tells scientists Iceberg is around 16 years old. Researchers were also able to determine that Iceberg is indeed a male. Male killer whales on average live to be around 29, but have a maximum life expectancy of 50-60 years old. Females on the other hand live to be an average age of 50, but have a maximum life expectancy of 80-90 years. The age of Iceberg tells the group of researchers who spotted the white orca that they should have several more years to study him. Of course, that is if they can continue to find him. The researchers are part of a group called the Far East Russia Orca Project (FEROP), and they have been studying the same waters for 12 years. The group is working on a project to stop noisy boating traffic and fishing in this area in an attempt to preserve the habitat. They first spotted who they believe was Iceberg in 2010, but on their next voyage in 2011 the white killer whale was not seen. Luckily this year's visit allowed for another encounter with Iceberg and better photos. The white orca appears healthy and well at the ripe age of 16. The FEROP researchers believe the white killer whale is the same one seen both in 2010 and 2012. 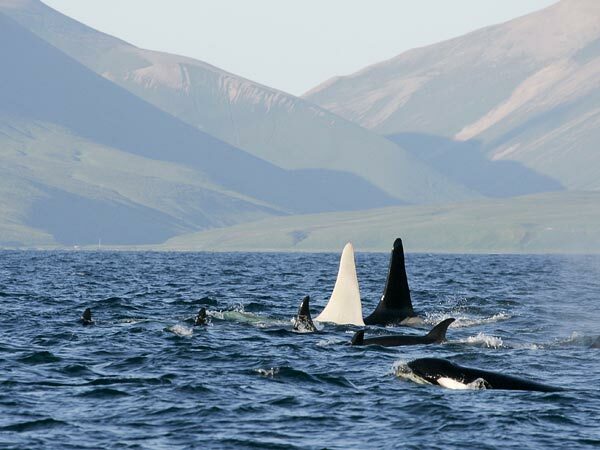 Other sources say they spotted a white killer whale back in 2000 and 2008 off the coast of Alaska. This whale was a little darker in color, but the researchers from FEROP have noted that their skin coloring can change according to season and algae on the skin. Scientists from the University of Aberdeen in the UK say it would not be unlikely for a pod to make the trip from the Alaskan waters to the Russian waters. Killer whales have been observed to migrate up to 1,240 miles. The white killer whale swims with his family or "pod" of black and white whales. Either way, we know that at least one white killer whale is still in existence and that we still have so much to learn about life under the sea. 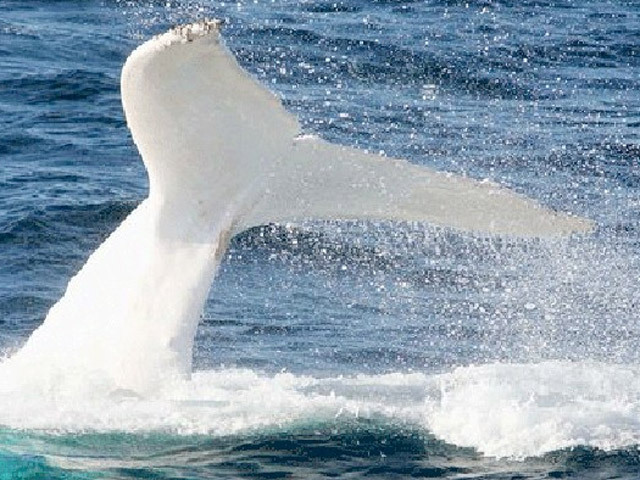 The FEROP researchers will continue to study the waters and hope to discover if the white whale is actually albino. One way to tell would be by getting a good look at the color of his eyes. Iceberg does have some coloring under his dorsal fin and has always been spotted with a pod of 13 black and white killer whales, so researchers say it is likely he is not albino. He may just be one of a kind and can help promote saving the seas so that researchers can continue to find such amazing and beautiful discoveries.